Our local grocery stores seem to have everything these days, but you likely won’t find rattlesnakes, ostrich, pigeons or live octopus on the shelves. You would probably even be hard pressed to find them at any restaurant. Although most Americans might consider these meals strange, they are considered delicacies in countries like Vietnam and South Korea. So, if your palate is bold enough and you do get a chance to travel to a country where these unusual foods are served, they might be worth a try. In Southeastern Asia, it is not uncommon to find snake on the menu. In Vietnam, snake wine is considered to be a delicacy with medicinal properties. The strong cocktail is made from snake blood and is commonly bottled with a snake or scorpion inside. Snake is also eaten fried, grilled or even in the form of hamburgers and sausages. Ostrich has been served for decades in countries like South Africa and is just beginning to grow in popularity here in the United States. Some of the finest chefs have begun preparing this unique meat in a variety of innovative ways, including ostrich burgers and even omelets made from the bird’s eggs. Most New Yorkers scoff at the dirty pigeons in the park, but pigeons have been consumed for hundreds of years. Pigeons, not as commonly eaten anymore, may seem strange to most Americans, but it is still a popular and expensive dish in France and many other parts of the world. 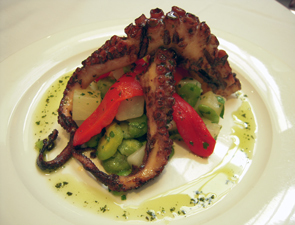 Octopus doesn’t sound so unusual—after all, calamari is a common dish at American restaurants. 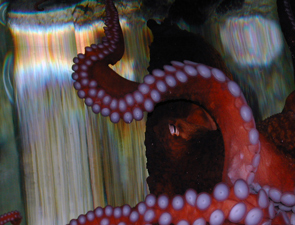 But unlike calamari, some small species of octopus are served alive in South Korea and other Asian countries. Live octopus is intended to be sliced up and eaten while the legs are still squirming, which often may continue for a few minutes. Sounds appetizing? What’s the most unusual food you have ever eaten?